As an internationally oriented university, UTBM is pleased to welcome foreign exchange students for one semester or more. UTBM values the diversity created by this international presence, as an important factor for success in teaching objectives. The fact that more than 20 % of our students come from abroad proves the success of our exchange programs. Both academic and practical aspects of the international student’s stay should be of high quality. UTBM has therefore developed an increasing number of English Taught Courses and tailored welcomes for exchange students. The International Mobility office and the Welcome Club provide them with the support they need. 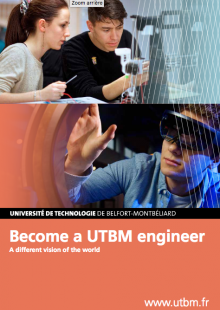 Visiting UTBM for one semester or more is an opportunity to get a French experience at a renowned Engineering school, n°4 in the country and member of the Conférence des Grandes Ecoles, in a city at the industrial heart of Europe. If you’re a foreign student wanting/coming to study at UTBM for one or two semesters, you will find here all the information regarding your stay at UTBM. At UTBM, courses are organized into “Units of Value” (or UV for short). Exchange students can choose a program in english (for a semester) available in Industrial Engineering, Mechanical, Computer Sciences or Energy. Exchange students are allowed to choose classes from the courses catalogue as long as there is no time table conflict. One UV is equivalent to 4 or 6 ECTS (European Credit Transfer System). International Students are allowed to take a maximum of 30 ECTS per semester. That is why we advise students to choose between 4 and 6 classes per semester according to the number of credits delivered by each course. To validate your UVs, you will have to sit two exams during each semester: one mid-term and one final exam. 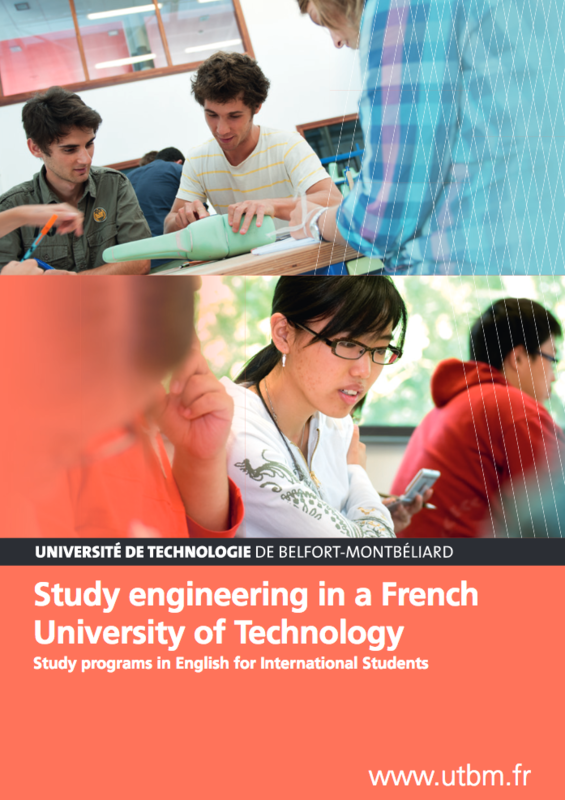 Even if most of the UVs of the course catalogue are taught in French, international students can join a great number of scientific and non-scientific classes taught in English. The level of studies (Bachelor or Master) depends on the student’s background, and is defined according to the UTBM curriculum. Nevertheless, international students are allowed to select their courses among both levels depending on their study plan and their previous experiences. An intensive French course is organized for all incoming international students during the Welcome week (2 – 3 weeks before the start of classes) and students are able to continue learning French during the semester with the French as a Foreign Language course credit. With five different levels (beginners to advanced), the French course gives students the possibility of taking the international certificate of French proficiency. Moreover, various types of projects can be carried out in English under the supervision of a faculty member in one of UTBM’s laboratories or departments. It is also possible to join an independent study class on a topic chosen by the candidate. 2nd step: as soon as your home university sends us your nomination and contact information, we will give you further instructions for the online application form. 3rd step: fill in the online application form. Students coming from a country outside the EEA (European Economic Area), Switzerland, Monaco, Andorra, San-Moreno, Vatican and Algeria must have a valid passport to enter France. They must also ask the French Embassy or Consulate in their home country for a long-stay visa (for stays exceeding 3 months). You must add the OFII application form to your visa request. You will have to register to the French Office of Immigration and Integration (OFII) during the first three months of your arrival in France. Students coming from a country member of the EEA (European Economic Area) need to have a valid passport or ID card. Copies of School or University Diploma or most recent grade transcripts (in French or English). The Student Mobility Service at UTBM will help you with the administrative process. Please make sure that all of your supporting documents are translated into French. Always give copies. Never give the originals!! 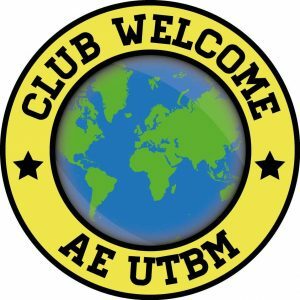 The Welcome Club aims to offer all international students the best conditions to arrive at UTBM. It takes place one week before the beginning of each semester (September and February). Program: meals, shopping, orientation tour, help in administrative procedures, cultural exchange. The fresher’s fair takes place right after the Welcome Week. It lasts 4 weeks. The fresher’s weekend is the last event of the fair. Don’t miss that unforgettable moment! Much more events are organized throughout the semesters. For more information, please visit the AE’s (student’s union) and Welcome Club’s websites. Please note that students who are more than 28 years old won’t be able to join the UTBM as an exchange student because of the French “sécurité sociale” ( PhD students must be under 32 years old). EU students must have a valid European Health Insurance Card (EHIC). This will assure you to be financially covered (based on your home country’s healthcare policy) in case of an accident or visit to a doctor. Also bring you vaccination records. Non EU students must subscribe to the student “sécurité sociale” for their medical bills to be covered. It will cost you around 214 euros for a year. At UTBM, you can become affiliated either to the LMDE or to the SMEREB. The “sécurité sociale” reimburse on a pro rata basis (up to 70% for a visit to the doctor). In order to be fully reimbursed, you will have to join a complementary insurance policy, called a “mutuelle”. Students from Quebec are exempt from joining the French Student Social Security upon presentation of the Form SE401-Q-106. · A visit to the doctor will cost you 23 euros. You will need to pay the general practitioner directly (cash or credit card) and will be reimbursed later. · If you are given a prescription, you will need to go to the pharmacy. You will have to present your “carte vitale” as well as your “carte de mutuelle” if you have one. Depending on the medicines, you may be asked to pay a small amount. Student housing is made available to all exchange students preparing a semester with the UTBM. We currently have the following choices for accommodation ; all housing options are in student only residences and offer affordable accommodation in a convenient, safe location. A Studio appartment in Belfort : A fully furnished space of 18 to 25 square meters within less than a minutes walk from the Belfort campus and about 10 mintues from the city center. An individual room in Belfort : A space of 9 square meters including a full bath within a 10 minute walking distance from the Belfort campus; a communal kitchen space is made available for students or the University Restaurant is right next door.